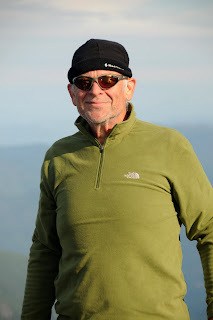 Bellingham local and Northwest hardman, Blake Herrington, just emailed us to let us know that he will be doing a slideshow on his many adventures at Backcountry Essentials in Bellingham on October 1st. It should be a lot of fun! Some time ago, we ran an article on basic aid climbing technique. We introduced aid climbing with a little breakdown of what it is all about and with a couple of videos. Today, however, we would like to present a short video on refining aid movement. To see our original post on aid climbing, click here. 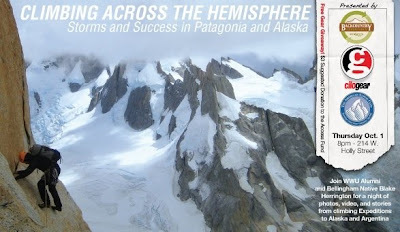 To see other Chris McNamara videos on aid climbing, click here. To read about the American Alpine Institute's new aid climbing course, click here. 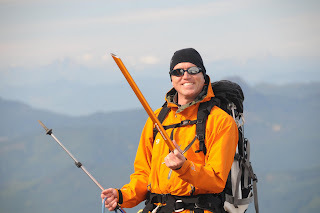 Last week I taught a Alpinism 1 course for American Alpine Institute. It was a great trip with good weather almost every day except the summit day. In this course we start out teaching the skills needed to climb the mountain, and then on the final day we make an attempt at the summit. 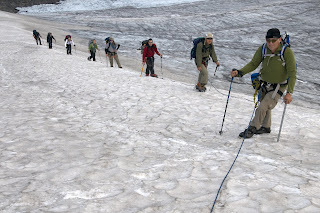 Teaching basic mountaineering skills at the base of the Colman Glacier on Mt. Baker. 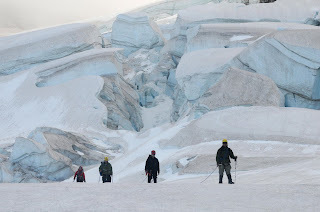 The Colman Glacier is a huge glacier and perfect for teaching glacier mountaineering skills. One of our climbers enjoying the weather and figuring out how to use an ice axe. 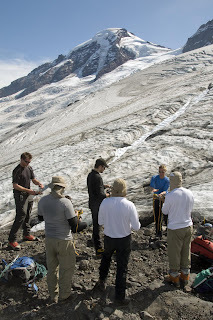 Angela leads a rope team through some crevasses for a little practice. Our complete group practicing working as a rope team. 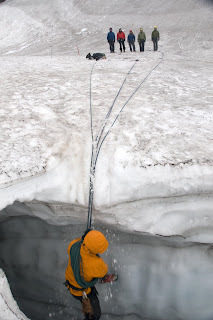 A two person rope team crevasse fall is a serious thing. Here we allowed each person to catch a fall and fall in a real crevasse. The two extra ropes in the photo are back up lines in case the fall is not stopped. A perfectly executed self arrest. The guides. Me, Angela and Richard. Our headlamps lighting up the fog on our summit attempt. 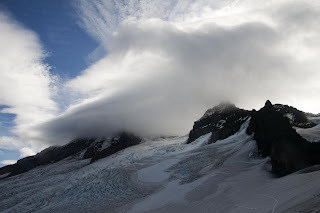 As you can see the weather was not cooperating, and very strong winds were causing a huge lenticular cloud to cover the summit. 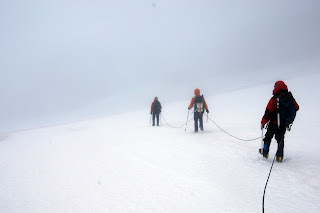 Due to the strong winds and low visibility we turned the group around at about 9,000ft. Angela at our high point. 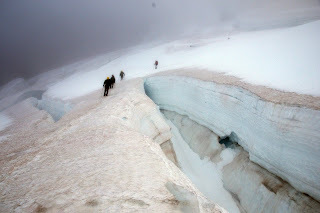 Negotiating crevasses on the way back down from our high point. 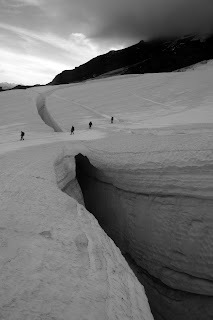 A nearby crevasse with the Canadian part of the North Cascades in the background. The second rope team making their way down. 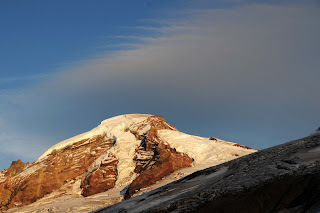 The lenticular cloud sitting over the summit. 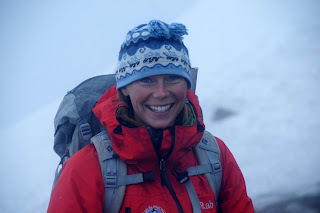 --September 30 -- Grand Junction, CO --Sir Chris Bonington, "I Choose to Climb"
Meet AAI Guide Dawn Glanc, Mountain Hardwear Athlete and AMGA guide. 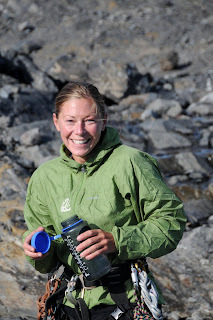 Dawn will be presenting a slideshow and discussing her various climbing adventures and accomplishments. Learn about the "Big Expedition for Cancer Research and win door prizes! 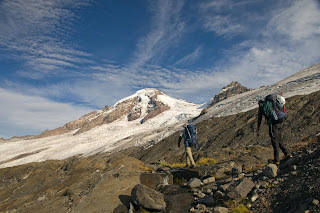 The event will be held at Mountain Hardwear, 250 Pine Street, Seattle, WA. For information, please contact AAI (info at aai.cc or (360)-671-1505), or call Mountain Hardwear at (260)-441-2639. Time for another dose of the stoke...enjoy, have fun, and be safe out there! 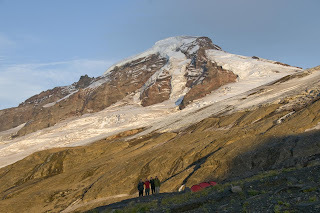 Our flightseeing tour took us over Mount Baker, Mount Shuksan, the Pickets, Cascade Pass and part of the Ptarmigan Traverse. It was an awesome experience to see so many remote peaks by plane in such a short time. The following photo essay details some of the trip's visual highlights! Note that the pictures may be enlarged by clicking on them. Due to the warm summer, this glacier is far more broken than normal. 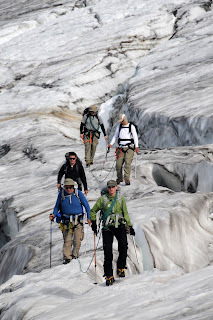 Many parties are finding that they must belay across numerous crevasses. 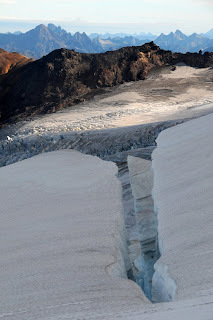 A close-up of the icefall between the Easton and the Deming Glaciers. 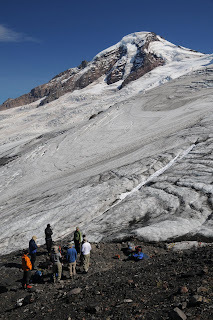 Mount Baker's Boulder Glacier is in late season conditions. Any ascent of this route this late in the season will require ice climbing skills. The peak in the center of the picture is the South Twin and the peak on the right is the North Twin. 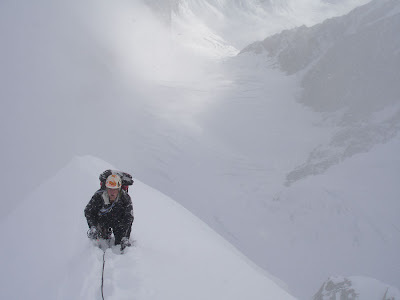 In 1995 I made the first recorded winter ascent of the Northwest Face of the South Twin. It's hard to see in this photo, but during the flight we were able to spot a few ski tracks on the Sulphide. Icefalls on the Sulphide -- The climbing route avoids this mess. Mount Challenger is arguably the most easily accessible peak in the Pickets. However, it still takes most parties four to five days to climb. This is arguably one of the most remote places in the Cascades. The peaks pictured above are in the Southern Pickets. From left to right we are looking at the McMillian Spires, Inspiration Peak, Mount Degenhardt and Mount Terror. AAI Guide Alan Kearney recently wrote an excellent article about his 35 year obsession with the McMillian Spires. To read it, click here. Note the ice patch just left of center. This is where the ice climbing on the Northwest Face/North Ridge of Forbidden Peak may be found. 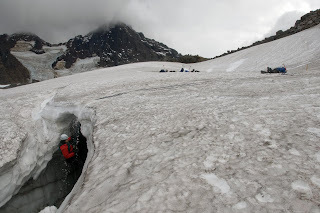 AAI Guide Mike Pond recently found five pitches of steep ice on this feature. 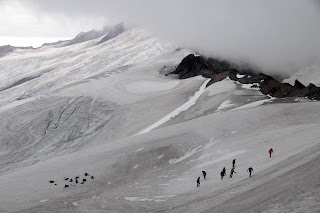 The Inspiration Glacier along with the McAllister and the Klawatti Glaciers make up one of the largest non-volcanic glacier systems in the state. Mount Torment is the peak on the left end of the ridge. on Mount Torment earlier this summer. The top of the Sahale Arm, Sahale Peak's summit and Boston Peak. 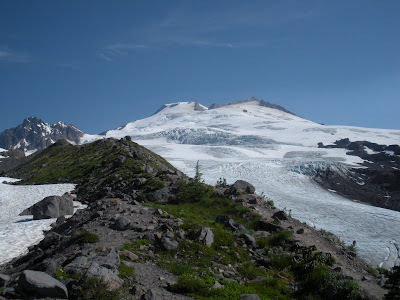 If you look carefully, it's possible to see the Forbidden Glacier and the North Ridge of Forbidden in the background. It is clear that there is not much snow left in the Cascades. We did get a dusting late last week and you can see the remnants of that in some of these pictures. The glaciers don't look as dirty or as gray as they did prior to the snowfall...but other than that, this is one of the driest times of the year. As such, it is really interesting to look at an array of peaks throughout the range...! It appears that the Canadian Guide, Mike Barter, is starting to incorporate a few cooking tips into his videos. Last week we posted one of his videos wherein he discussed the clove-hitch while making pancakes. This week, we're posting one of his videos wherein he makes salsa while discussing the merits of the carabiner break for rappelling. As with his last cooking/climbing video, we found this one to be kind of fun while still being educational. Pulling through the last few moves on “Lude Crude and Misconstrued,” a popular 5.9 located in the Black Corridor of Red Rocks, is not a particularly difficult thing to do. The moves at the top are easy. No instead, the scariest part of the climb is not the climb itself, but the anchors. So many people have put their rope through the chains at the top of the route and then proceeded to toprope or lower off the anchors that the sawing action of hundreds of ropes has nearly eaten them clean through. This is a chronic problem at sport climbing areas across America. Chain and quicklink anchors are severely damaged due to ignorance or laziness. The problem is most visible however, in places where it is sandy. Once a rope gets sand in the sheath it literally becomes like sandpaper. The repeated sawing action of a moving tensioned rope -- especially one with sand in the sheath -- may severely damage anchor chains in as little as a matter of hours. The question then must be asked, who is responsible for a newly damaged anchor? Is it the first ascent party's responsibility to replace the anchor? Is it the responsibility of a local guide service? Does it become the problem of local climbing conservation groups? Or are the people who damaged the anchor responsible? There is no right answer to the preceeding question. I have personally replaced innumerable anchors out of my own pocket. I know a number of others that have the same. We do this because we don't want to see anybody get hurt. But it's not something that we want to do. Most of us who put up new routes or repair existing climbs simply avoid toproping directly through the chains. Instead, we use a cordelette or a double shoulder-length sling in conjunction with locking carabiners. To the left is an example of a rope threaded directly through the anchor. Do not do this for anything but a rappel. On the left-hand side, the anchor is composed of quick links. These are easier to change-out when they are damaged. On the right, the anchor is made up of chain purchased from a hardware store. This is more difficult to replace when damaged. The photo on the right provides an example of a properly set-up toprope. The anchor is composed of a double shoulder-length sling, tied into a pre-equalized eight. At the bottom, clipped into the power-point (sometimes called the master-point) are two opposite and opposed locking carabiners. This is the best possible system as it meets the requirements for a SRENE or ERNEST anchor and protects the anchor chains from damage. There are two organizations that are currently replacing bolts and anchors throughout the country. The first is the nonprofit American Safe Climbing Association (ASCA) and the second is the Anchor Replacement Inititive (ARI) sponsored by Climbing magazine, the North Face and Petzl . It is possible to support the ASCA with donations and to support the ARI by purchasing items from their corporate sponsors. Checking anchors to make sure that they are not damaged, replacing those that are or providing financial support to those who will replace them, and reporting damaged anchors to individuals who will fix them is the responsibility of every climber. But perhaps the greater responsibility is to simply avoid damaging an anchor to begin with. I thought that we should continue where we left off on last Saturday's blog and take a look at another ski video to firmly cement the dreams of backcountry skiing into our minds. This awesome video is from Powderwhore's newest ski film. Flakes: the latest ski film from Powderwhore from Black Diamond Equipment on Vimeo. And to make sure everyone also gets a little climbing fix, here is a video of Hayden Kennedy climbing the Bachar/ Yerian (5.11c R/X). Enjoy! Hayden Kennedy on the Bachar/Yerian (5.11c R/X) from Black Diamond Equipment on Vimeo. In the 1920s and 30s Robert Underhill was one of the top climbers in The United States. Frequent climbing trips to the Alps left him well versed in state of the art rope techniques. In 1931 the Sierra Club invited him to California to teach its members proper belaying and rappelling. Afterwards he and some of the other climbers toured the range and made a number of first ascents. Chief amongst these routes is the East Face of Mount Whitney, which Underhill climbed with Norman Clyde, Glen Dawson, and Jules Eichorn. 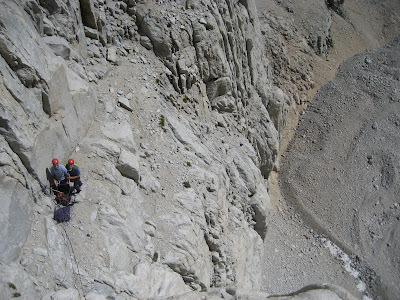 This fun and exciting route is one of the best alpine rock climbs in the range. A few weeks ago Matthew Holt, Fiona McIntosh and I shouldered heavy packs for a hike to the base of Mount Whitney and a crack at this route. 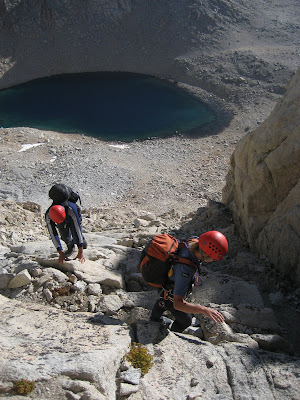 Matt and Fiona had travelled to California from South Africa for a week of rock climbing culminating with this ascent. We made the 4 mile hike in in good time and enjoyed a very brief swim in the aptly named Iceberg Lake. 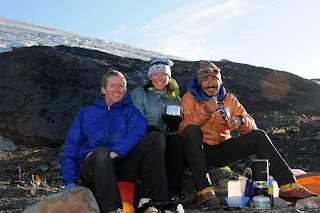 Matt and Fiona are backcountry gourmands and their dinner highlights included fresh vegetables, hot soup, tea, and cookies. Scrambling to the base of the route. The first pitch is the “Tower Traverse”, 130 feet of airy 5.4 and 5.5 climbing. After this, a prominent 400 foot ramp of easier climbing leads to the “Fresh Air Traverse”. At this point, the youthful Dawson and Eichorn wanted to continue straight up, but more experienced heads prevailed and the party made the now famous traverse. Matt and Fiona moved handily up this pitch, despite the 1000 plus feet of empty space underneath their heels. Fiona had brought her camera along, and frequently asked Matt and I to hold still while she captured the action. Two pitches later we were at the technical crux of the route, a 20 foot corner with a wide crack in it. Usually wide crack climbing is awkward, but this section was passed smoothly with stemming and the liberal use of handholds hidden in the crack. After the crux, many climbers traverse right to meet up with the East Buttress route. However, continuing straight up allowed us to enjoy two more long pitches of moderate 5th class climbing on good rock. 50 feet of much easier, blocky climbing deposited us on the summit. This fun and exciting route is one of the most classic alpine rock climbs in the range, if not the nation. It features an unbeatable combination of a classic location, great granite, and excellent California weather. 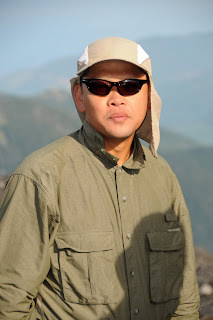 Denali National Park and Preserve provided assistance to the Alaska State Troopers by evacuating an injured hunter, Victor Cubanyi, 48, of Fairbanks from Seven Mile Lake near the Rex Trail on Friday, September 11. Cubanyi had sustained chest injuries when his ATV overturned while he was traveling south of the lake the previous evening. Despite his injuries he was able to walk back to Seven Mile Lake and summon assistance from his companion at a nearby cabin. On Friday morning his companion contacted authorities requesting medical assistance. A ranger-medic and pilot responded in the park’s contract helicopter and met Cubanyi and his companion at a small airstrip adjacent to the lake. He was stabilized and flown to Fairbanks Memorial Hospital for treatment. Seven Mile Lake is located approximately seven miles east of the Parks Highway at Mile 280. In the past we have covered the clove-hitch before. But when we saw the Canadian Guide, Mike Barter's new video, we just had to post it. We have posted a number of his videos over the last year. He makes a nice instructional video. But most of them aren't very funny. Instead, they're too the point. However, he recently posted this amusing video where he discusses the merits of the clove-hitch, the merits of Canadian pancakes and the merits of beer in the morning. Come celebrate National Public Lands Day and help Denali National Park and Preserve by volunteering for a one-day project on Saturday, September 26. The National Park Service (NPS) is seeking volunteers to join one of the park’s trail crew leaders in removing light vegetation from trails in the park’s entrance area. Participants will meet at10:00 a.m. at the Murie Science and Learning Center, located at Mile 1.2 on the Denali Park Road. The NPS will provide work gloves and tools. Volunteers should bring their lunch and water and be prepared for any weather, as the project will take place rain or shine. Trail work will be completed by 3:00 p.m. Participation is limited to those 18 and older because the project requires the use of sharp tools. This year is the 16th celebration of National Public Lands Day, the nation’s largest hands-on volunteer effort to improve and enhance our public lands. Eight federal agencies and many state and local lands organizations participate in this annual day of caring for public lands. Additional information is available at www.publiclandsday.org. Additional park information is available on the web at www.nps.gov/dena or by calling the park headquarters at (907) 683-2294 between 8:00 a.m. - 4:30 p.m., Monday-Friday. 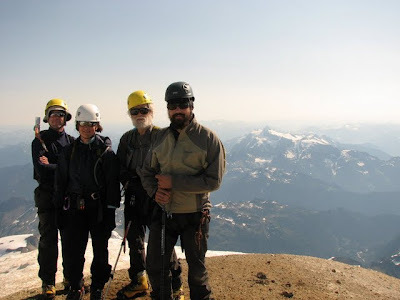 This year I had the chance to climb Mount Baker with the Hedge family. It was a great experience to get to work with them. The head of the team was John, the father. His two children Laura and Andrew, who are now in there 30’s, and Laura’s husband Vince made up the rest of the team. It was a team of varying ages and ability levels. But I assured them that if we just went slow and steady, we would reach the summit successfully. On the climbing day we awoke to a perfect day. We had great weather. The temperatures were perfect and the wind was absent. Our team set out about 1 hour after the other rope teams. 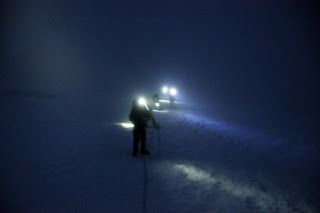 We watched as their headlamps bobbed up the mountain ahead of us. I moved our team slowly and steadily up the mountain. As the sun rose, we could see that we were quickly gaining on the other rope teams. Near 8,500 feet on the mountain we passed the lead team. We arrived onto the summit first that day, welcomed by perfect conditions. It was warm and perfectly calm. It was a beautiful day. We descended down the mountain in the same casual pace as we had ascended. 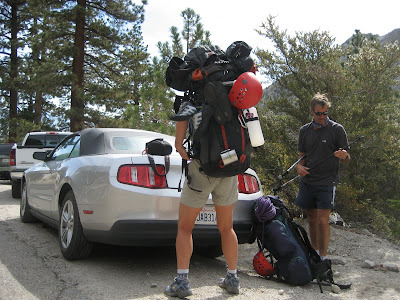 The pace seemed to be perfect, because we arrived at camp in no time at all. The rest of the night each family member looked back toward the route we had climbed. The sun was setting and casting a majestic light on the mountain. John, Laura, Andrew and Vince were each amazed that even though we were slow, we were still the fastest team. John, at age 67 knew that this was going to become a sort of bragging right. Its starting to become that time of year here in the Cascades where the weather begins to become a little bit fickle. By no means does that mean that climbing is even close to being done here, but it does start to spark ideas of climbing in a new environment. For me this conjures up images of the desert, where the days are warm and dry, the nights are clear and cool, and the climbing is awesome. So whether you are thinking of Joshua Tree, Red Rock, or one of the many places in Utah, I thought this video of Alex Honnold in Indian Creek would be sure to get you stoked on the climbing down south. Alex Honnold sending in Indian Creek, Utah from Black Diamond Equipment on Vimeo. But if you are one of those people who have been praying for the cold wet weather to begin since the last ski season ended, then this video is sure to get you excited for the upcoming winter season. 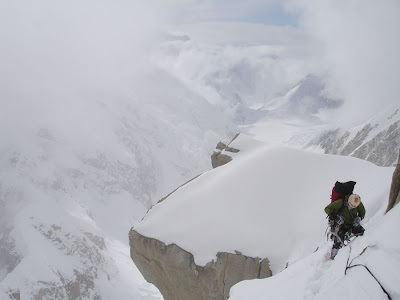 The Cassin Ridge on Denali has become one of the most sought-after big mountain alpine climbs in the world. There are few routes that follow such a beautiful and continuous line 9000 feet of challenging granite and ice that end right below the highest point in North America. 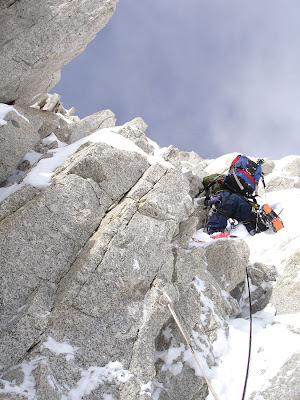 The Cassin Ridge is very challenging, with 65-degree hard ice, mixed climbing on steep ground, and rock to 5.7. We recently received a serious inquiry from an individual who would like to climb the route with us. 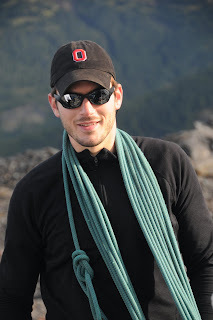 This climber lives the Pacific Northwest and wanted a good solid list of prep climbs in Washington and British Columbia. Prepping for a guided ascent of such a high end route will inevitably make an individual and extremely competent independent climber. Indeed, most of the prep climbs are phenomenal routes in and of themselves. 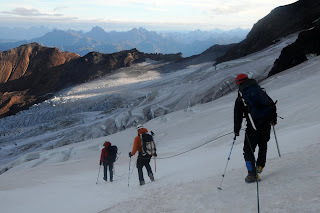 In addition to the alpine climbs that we have listed, we are asking that prospective Cassin Ridge climbers spend a significant amount of time climbing multi-pitch water ice. This could be in Banff, Ouray, Silverton, Telluride or anywhere else where there are long multi-pitch ice climbs. 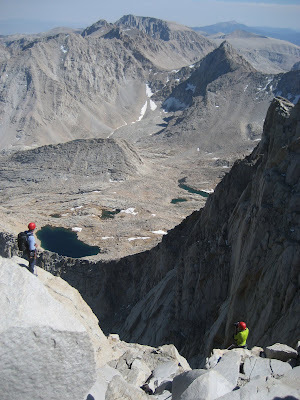 Those who would prefer to climb such a route without a guide might want to complete all the previous routes, as well as a handful of climbs in the Alaska Range such as Ham and Eggs on the Mooses Tooth, the West Ridge of Mount Hunter and the West Face Couloir on Mount Huntington.